Treasuries are very quietly breaking down to new lows after a feeble bounce attempt late last week. The UAW is selling Ford warrants tomorrow that will be the equivalent of a $2 billion + offering by my very rough calculation. Ford has been a very strong momentum stock recently. It will be interesting to see how it holds up in the face of the supply. The turn of the month from March to April is one of the seasonally strongest times of the year. In the past two weeks the market has gone sideways and worked off the short term overbought reading setting up for a continued move higher. According to most surveys hedge funds are pretty long heading into quarter end as are mutual funds. The powers that be would be very happy with a strong end to the quarter. 1150 on the S&P 500 is very strong support and is not that far away. I took a small short position early last week at levels slightly below where we sit today. A confluence of indicators were at levels that had previously led to corrections. I would expect to make money in 9 out of 10 situations where so many indicators lined up. However, the more time that passes the less conviction I have that we will get a meaty correction. I will be looking for an opportunity to flatten out on Monday as I have very little conviction as to the near term direction of the market. As I wrote this morning, I would view a rally into late April as a gift to get short. What happens between now and late April is the tougher call. Have a great weekend. My last post got me thinking and I can't help but suspect that quarter end has something to do with the move in high beta stocks. This might be the result of window dressing or just a repositioning of portfolios for the new quarter. There is a decent chance that by the time the new quarter rolls around the rotation will be done as everyone will have already repositioned or window dressed. The only thing that is more amazing than the persistence of this move is the persistence of the rotation into high beta stocks. This comment might fly over the head of many as it took me many years of trading before I noticed how money rotates from sector to sector. I don't think I have ever seen such a persistent rotation into high beta stocks without a break. I am extremely tempted to put out the shorts I covered at the end of the day yesterday but am feeling under the weather today so I will take a pass. Every pullback in the last six weeks has been a one day wonder or better yet a half day wonder. After almost every pullback we would see the bears come out of their cave and declare the beginning of a correction. Today we are seeing heavy call buying as everyone has learned to buy the dip. In the very short term I don't believe that the market is done correcting. Sentiment has become so stretched that the bulls should get a gut check at minimum. I expect we will see another down day either today or Monday. After that the near term outlook becomes a lot murkier as I could make an argument for both the bulls and bears. The government will start selling Citigroup shares in late April. 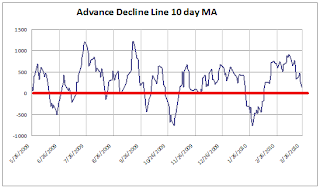 Positive seasonality becomes negative seasonality. If we rallied into late April, could you imagine how stretched sentiment would be on both a short and intermediate term basis? Quantitative easing ends this month. Another wave of mortgage resets is starting. In the latter half of the year stimulus becomes a net negative year over year. Municipal and sovereign imbalances are getting worse. I covered the SPY short I put on this morning. I am back to a small net short position. There was another bad treasury auction today. With Google angering the Chinese and the US about to label China a currency manipulator one has to wonder whether someone is being taught a lesson. Treasuries fell through their six month lows like a hot knife through butter. Next up are two and a half year lows that are about a percent away. After that treasuries have a long way down before reaching support. Treasuries are testing 6 month lows now but who cares. I stopped myself out of my Gilead trade but am going to keep the short SPY side of the trade on. My short position is now medium sized. I have added to Gilead Sciences and shorted SPY against it. According to Bloomberg the government will start selling shares of Citigroup in the latter half of April and get rid of the position over the course of the year. Late April was around the time I was looking for a lasting top in the broader market and this strengthens the chances of that being the timing. I still believe there is room for a correction now, but I don't believe that it will be of the magnitude we saw in January. I though that if the government sold their Citigroup shares in the coming days we could see that type of correction but that scenario seems to be off the table. Home sales have gradually become weaker since the original first time home buyer tax credit expired. The credit was renewed but but the original offer stole demand from the future and sales have dipped anyway. The current credit expires in April and will not be renewed again. There was a surge in home sales as the original tax credit was reaching expiration. Under the new tax credit contracts must be signed by the end of April and the deals must close by the end of June in order to qualify. This could cause another wave of home sales, albeit not as large as from the original offer. It is quite obvious to me that as the tax credit expires we will see a pickup in home sales.That should lead to a drop off once the tax credit expires that puts as at lower levels of home sales than current rates. The stock market was once rumored to be a discounting mechanism that looks through these type of events. I am not certain that is the case any longer. If the better home sales in the coming months is celebrated and not seen as a one time event I believe that strength could be shorted. I have been getting a lot of questions recently on where I would put new money in healthcare. The answer to that question has been Pfizer. Now that Pfizer had had a nice rally, while Gilead is getting hit up I am more partial to Gilead. The thing that is jumping off of my screen this morning is that treasuries are getting smoked. The move seems unusual in light of the lower futures. While current interest rate levels do not seem to be hurting the economy a strong sell off from these levels might start to do some damage. The march higher continues as there are simply no sellers to be found. The market has now broken out from last week's range. I am continuing to hold my small net short position. Have a good night. Amgen was by far my largest holding and remains my largest holding but not by as much. As Amgen has risen and other healthcare names have floundered I have raised the weighting of other holdings over the past few days. I am short a boatload of PFE April and May 17 Puts. I am also long a good amount of Gilead Sciences. The market is currently in its window for a decline. 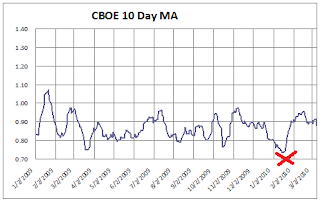 The 10 day moving averages of the put/call ratios have reached an extreme. Expiration is now behind us and the market will be overbought on an intermediate term basis tomorrow. This window will stay open for about another week when the beginning of the month rolls around. The S&P 500 is sitting where it was a week ago, even though it might feel like the market is taking off. It is generally very difficult for the market to make large advances under the conditions I described. I am going to continue to give the benefit of the doubt to the bears given the current backdrop. There is nothing like a buy the bad news reaction to turn the final non believers into believers. In the meantime all the market has done is revisit last week's highs. At every high in the past year the market has spent some time testing the highs and even making marginal new highs before rolling over. I believe that is what is currently occurring. I remain of the belief that a tradable top is being put in. Have a good night. I think the coming correction will be contained unless we see heavy stock issuance. The mother of all offerings would be the government selling their Citigroup stake. If I were a bull I would be praying for the stock to go down so that the government does not want to sell. The further above $4 the stock goes, the more likely the government will be to sell. While I could see the market rejoicing when the offering is announced I don't believe there will be much rejoicing once the shares are issued and the market is choking on it. It seems to me that many have been caught relatively off guard by the passage of health care reform. Many are scrambling to figure out the effects of the bill. While a bounce is not out of the question, uncertainty and a stretched market are not generally a formula for major upside. Once the expiration influences are out of the way next week we should get a better sense of where this market wants to go. 1150 was very tough resistance on the way up and should provide support the first time it is tested. Have a great weekend. Expiration days are the hardest for me to game. I rarely do any directional trading on expiration although I will look at individual stocks that I believe are out of kilter because of expiration from time to time. Yesterday, I complained that the Rydex traders were not yet bullish and lo and behold they became bullish. Rydex traders still have minimal short positions on and have now upped their longs. Rydex traders have become extremely bullish. While not every case of extreme bullish sentiment at Rydex has led to a top, Rydex traders were extremely bullish at every top. Another indicator has fallen into place for a correction and the bulls job will be that much tougher. While options expiration has been extremely bullish for the market, I expect that a correction will begin by next week. I am heading out early. Expiration is now firmly in control of the market and it should stay that way until Monday afternoon. The VIX is at 16.44 so I don't plan on selling any volatility this expiration. Have a good night. The good news for the bears and myself is that the market seemed to have run out of steam midday. I like it when the market turns on no news as it is a sign of exhaustion. The bad news is that there was not much follow through selling once the market turned lower. Option expiration will likely be in control of the market for the next few days. Have a good night. In an earlier post I showed how the put/call ratios are looking a lot like they did at the January top. In this post I wanted to go over the differences between now and January. 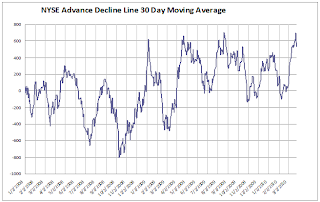 The 30 day moving averages of the put/call ratios are still not showing the excessive enthusiasm they did in January. This is more of an intermediate term indicator. 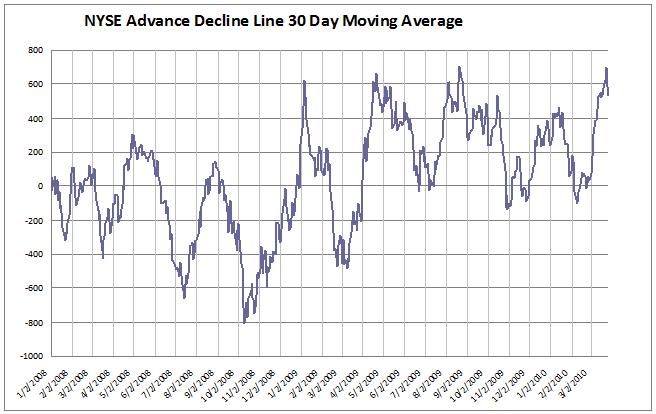 The 30 day moving average of the advance decline line won't be overbought until the middle of next week. It was overbought at the January top. The spread between the bulls and bears in the Investors Intelligence survey is at 25%. In January it was at 35%. Corrections tend to start at the end of January when the market has been rallying for a while. We are in the heart of tax refund season and a seasonally strong part of the year. I took all these factors into consideration before shorting and still plan on building shorts further. I believe it is always important to consider all the facts. Not just the ones agreeing with one's positions. I have added to my short positions even though the S&P is only up 2 points since my initial short. I would categorize my net short position as small now. I used this morning's pre-market strength to move to a slightly net short position. I plan on adding on a 5 point scale up. Both the ISE and CBOE Equity only 10 day moving averages are in the area they were in at the January top. In January the market chopped around for a few days and proceeded to go down right after options expiration. Sound familiar? I literally had my finger on a sell short order at 3:59 and did not press down. I don't plan on putting on a big position until expiration but I think the current juncture probably warrants some sort of short position. I will be looking to short any further rallies. Have a good night. Goldman Sachs has downgraded Boston Scientific to Sell and added to its conviction sell list. Goldman Sachs equity ratings have a complete disregard for valuation. Tell me which way a stock has been moving and I could tell you what the Goldman Sachs rating is. Some of my best ideas have come off the Goldman Sachs sell list. American Express at $10 and Gap Stores at $19. Keep up the good work. I will be looking to purchase Boston Scientific if it gets closer to $6. The government is allowed to sell its stake in Citigroup as of today. $30 billion worth of new supply would not be a positive for the market and would likely hasten a correction. If they decide to go ahead with the offering this week a move in the market could be exacerbated by options expiration. While it is likely the government will divest its stake as long as Citigroup stays at these level, the government is notoriously slow moving so trying to figure out the timing of an offering is tricky. Putting Citigroup aside, the market is starting to look a little tired. New 52 week highs contracted significantly yesterday and the Russell 2000 lagged. The biggest problem with a correction is that too many market participants seem to be looking for one. Maybe yesterday's comeback will finally make the last holdouts come to the bull side and clear the way for a correction. Today's action was not what the bears wanted to see. The second the market turned lower the put buyers came in. At a good top the first dip is usually met with call buying as everybody believes it is a buying opportunity. It seems this market might have to do some more work on the upside before the bears have their turn. Have a good night. 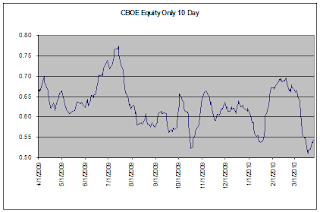 Options expiration week has the tendency to extend strong trends. I can't remember the last time I saw a strong trending market reverse direction on expiration week. Most turns tend to happen in the days following expiration. While I am not trading on this I am keeping this factoid in the back of my mind. Boston Scientific's shares are down nearly 16% on news that they are halting defibrillator sales due to an FDA issue. The issue seems to be a paperwork issue rather than a safety issue, as they made manufacturing changes without informing the FDA. This issue is likely to cause a permanent market share loss even once the issues are resolved. Defibrillator sales make up approximately 20% of Boston Scientific's profit. If Boston Scientific goes down a few percent more, a complete wipeout of defibrillator profits will already be priced in. The shares were previously cheap and seem to be even more discounted currently. Astute investors such as David Einhorn and John Paulson have large positions in the shares. I will likely start building a position on fiurther weakness. The bulls are actually better off with a correction beginning now before things get too extreme. A few days on the downside would allow the market to work off its overbought reading and for sentiment to become more neutral. After a correction an attack on resistance would have a much better chance of succeeding. For my part, I remain fully hedged. Last week I wrote a lot about sentiment and how it would take a few more days of giddiness early this week to get the sentiment indicators to where they were at previous tops. That still remains the case but there are other indicators that would support immediate downside. A week ago, on Monday the 8th, the NYSE saw 470 new 52 week highs. By Friday, with the S&P 500 11 points higher there were only 436 new 52 week highs. That is a divergence that shows that some stock are starting to sputter. In addition, the market is very overbought. 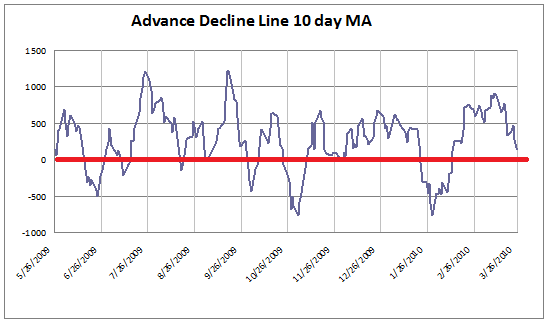 I use a 10 day moving average of NYSE Advancers - Decliners and below is the raw data that goes into the calculation. We will be dropping a string of 10 positive numbers starting with two very large numbers today and tomorrow. While it would make for a much easier short trade if we saw a couple more days of giddiness and everything lined up, there is certainly a case to be made for an immediate decline. I have been complaining about the 10 day moving averages of the put/call ratios and saying they were not likely to reach the type of extreme they saw in January or other major highs until next week. A reader on the message board, CP, posted a chart of the 5 day moving average of the CBOE Equity only that looked pretty extreme. I don't usually pay much attention to the equity only reading at the CBOE because it usually is inline with the overall reading, which I follow, and is not yet close to an extreme. Upon seeing the chart CP posted I decided to take a look. Below are the 10 Day moving averages of the CBOE and ISE equity only. 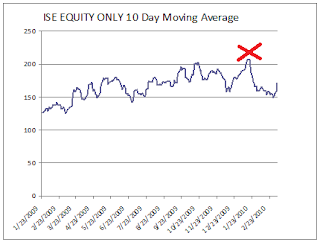 The CBOE Equity only is certainly closer to an extreme than the overall CBOE (which I posted 2 days ago) or the ISE Equity Only. I believe the market is closer to extreme optimism than extreme pessimism. I also realize that every top looks different and we might not necessarily see the same extremes this time around. To make things crystal clear I am not bullish and am actually slightly short because I got rid of Vodafone but did not dispose of the related hedge. I want to see the whites of their eyes before I get short and as a result run the risk of missing the top. However, that same cautiousness has stopped me from getting run over this entire run. Have a great weekend. I am out of my Vodafone trade. I sold the 22.50 covered calls against the position and there was only 4 cents of potential profit left in the trade so I decided to exit. I will look to buy again on weakness. The hints this morning that the market was going to fail were there. Namely Citigroup quickly traded down and the Russell 2000 severely lagged. I waited to see the opening readings of the put/call ratios and when they showed a lot of call buying I entered an order to sell short but was a step too slow and the order was not filled. I don't want to chase weakness but if the market does rally back and we see exuberance again I might take another swipe. Options expiration has tended to delay corrections. Most recently, the 9% January correction started right after option expiration and we had a 2% correction right after February expiration. If somehow the market continues to plod higher through expiration it would be a no brainer to get short at that point. The regional banks flood the market early next week with stock offerings in order to repay TARP. At a minimum, that should put a lid on the market and make it safe to short. The Big Kahuna. This coming Tuesday, March 16, is the date that the government is allowed to sell its Citigroup stake. At current prices an offering would be over $30 billion. 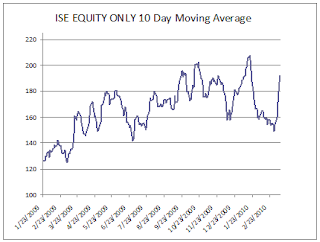 In some cases option expiration could exacerbate a move. It could get really ugly if the government comes to market next week. I wouldn't count on this one happening next week as the government moves mind numbingly slow. It should happen at some point if Citigroup's stock price stays at current levels. 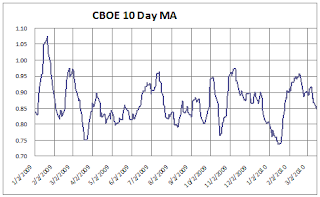 The 10 day moving averages of the put/call ratios should be at extreme levels early next week. The final option is plain exhaustion or a blow off. These are tricky and require a bit of intuition. In a blowoff I look for panicky buying as opposed to a steady advance. This should be accompanied by heavy call buying. We have not seen a blow off top in a long time. More often we have seen exhaustion where heavy call buying fails to lead to much upside. Most likely I will start slowly scaling into a short position this morning. If I see one of the above catalysts I will pick up the pace of sales. The air is getting thin as the S&P 500 continues its 100+ point climb without taking a break. This morning, the S&P 500 is breaking out past the January highs. Even if the market has really broken out, I believe that it is an extremely high probability bet that the market will come back and test this breakout level. The reason I believe the 1150 mark on the S&P 500 will be retested at minimum is twofold. Most of the time breakout levels are tested after the initial run, especially when the breakout happens after a parabolic run. The second reason is that the silly part of a run is usually erased in the ensuing correction and we are firmly in silly territory. The only question is that of timing and I will look at how I am considering timing a short trade in another post shortly. I realized that when the retail crowd gets involved all the extremes are generally reached. 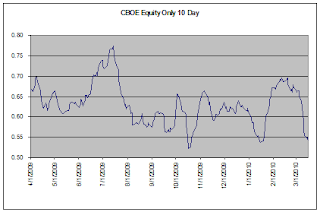 The 10 day moving averages of the put/call ratios are not yet showing extreme bullish sentiment. With Citigroup having such a strong day that will probably mean that more retail money will come in overnight. The loss was still small. I needed some time away from my screen this afternoon to try and make sense of recent market action. I decided to take a walk to Joe's Barbershop to get a haircut. As luck would have it a retail stock broker was getting a haircut next to me. I played coy and asked him what was going on with the market. He said that business was great and that the speculators are back. He likes Citigroup because Barclay's said they are looking for a US takeover and Citigroup is the cheapest US bank. He likes Ford because its going to be the next Toyota and he likes Jet Blue because the price is so low. I politely thanked him and wished him luck. I have come to the conclusion that the retail investor has been giving this market the extra energy that seems to make the market keep going and going. The move in Citigroup has really awakened Joe Sixpack's animal spirits. It could not have happened at a better time, tax refund season. This certainly explains why all the action has been in the most highly speculative, heavily shorted stocks. Joe Sixpack is not the best market timer but this is not necessarily bearish yet. What would tip me off that Joe Sixpack is about to get run over? The government could sell their Citigroup stake starting on March 16. If they choose to "Katie bar the doors". The large regional banks like Regions Financial and Suntrust have been on fire, hitting new 52 weeks highs. For the most part the large regional banks have not yet repaid the TARP. After PNC raised capital a few weeks ago I expected a flood of large regional offerings but there has been nothing as of yet. If there ever was a time to raise capital this is it and it is difficult for me to understand what these banks are waiting for. I have heard explanations that the regional banks are in such bad shape that they are afraid or can't exit TARP. I expect that next week we might see a few offerings. The reason I am focused on this is because I watch supply and demand of stocks. A heavy supply of new issuance would be a negative for the overall market and the regional banks and financials in particular. Yesterday we saw a continuation of the heavy call buying. 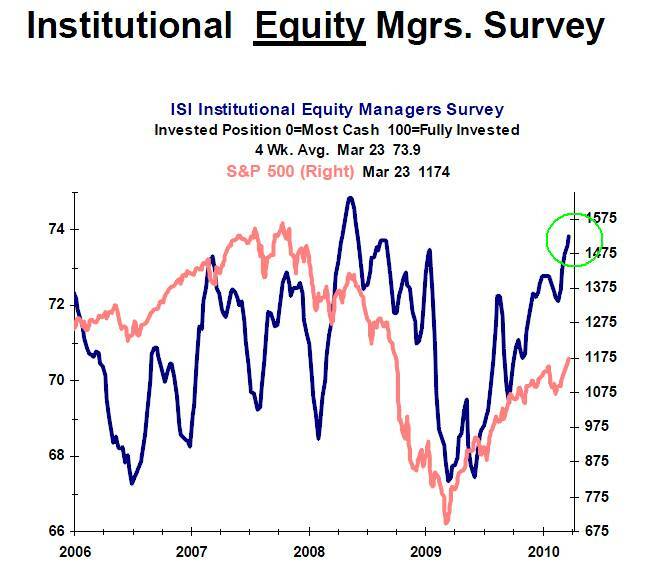 This morning we are seeing the American Association of Individual Investor survey come in at 45% bulls and 25% bears. That matches the largest spread between bears and bulls this year, which was seen in early January right before the nearly 10% correction. The positives are that the 10 day moving averages of the put/call ratios will take a few more days to reach a bullish extreme and that we are approaching option expiration. Corrections have tended to be delayed until after option expiration. There is nothing like a nice move in Citigroup to get the animal spirits roaring. The stock still has the ability to capture investor's imaginations like no other. The call buying is at similar levels to yesterday. The market is becoming more dangerous. I am tempted to add to my bearish bets but I am holding off. It will take some time to reach the extremes of early January, as I outlined in my opening piece. I want to make sure I don't run out of ammo in case we get there. My net short position remains small and we are trading right around the levels where I initiated my position yesterday. Citigroup is now up 10% from its Monday close on news that the government might sell its stake. At current prices the government's stake is worth about $30 billion. In Decmeber, Citigroup's stock sank over 20% when Citigroup raised $20 billion in equity to pay back TARP. This offering would be even larger. Why so many people would be so eager to step in front of the largest offering of stock ever is beyond me? The government's shares are locked up until the end of March, so the insanity could continue until then. After that the bulls might just get what they are hoping for, but it won't be pretty. 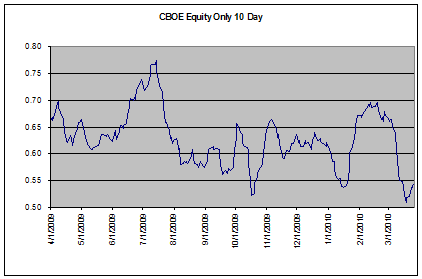 The CBOE equity put call ratio has joined the party and is chiming in at .46. Most readings under .5 usually lead to a nice whack within a few days. I bought the March 115 SPY puts and sold the 112 puts. The position costs me a little over $1 and I could make a maximum profit of $2. It is a small position. I am slightly net short. There is an endless drumbeat in the media about the one year anniversary of the market low. This is also the one year anniversary of the low in the economy. Year over year numbers are going to start looking a lot better. This is largely a statistical anomaly and in reality has little significance. The measuring stick has simply been shortened. If I measure myself in kilograms instead of pounds that doesn't mean my diet has been successful. Charles Biderman of Trim Tabs has been highly critical of the government and economy because he was tracking tax withholding receipts and thought the government was underestimating the job losses. He has now turned bullish on the economy because year over year withholdings in January were flat. His measuring stick has simply become shorter. Over the coming months we will see economic figures that appear robust while people on Main Street will be scratching their heads. By the second half of the year stimulus will be a net negative and comps will get a lot tougher. I believe this market will make an enduring top this Spring as investors will be dazzled with great year over year comparisons. That will set the trap. The market will be maximum overbought at the end of the day today. That means that even if the bulls manage to rally the market back in the face of this gap down opening they will be faced with a maximum overbought market at the end of the day today. At best the bulls are looking at a choppy to sideways market for the next few days until the overbought condition is worked off. The good news is that options expiration is approaching next week, which has tended to cap the downside during strong up trends. In addition, I outlined yesterday why I believe this correction will be relatively mild. The market is stretched and sentiment is starting to seem too rosy. Both the ISE and CBOE equity readings were showing a lot of action in calls and it seems like all the bears went into hibernation. In my opinion the chances of the market getting a whack this week are high. The first dip is usually bought by those who missed the rally so I'm not sure how much of a correction we will get. We'll cross that bridge when we get there. It felt like holiday trading today. There were a few times I thought my internet connection was down as my quote screen was barely moving. Have a good night. The stocks that are going up the most are regional banks that have not yet exited the TARP like Suntrust and specialty retailers like Abercrombie and Zumiez. Never mind that many of these regional banks can't even exit TARP because their assets are so bad. Never mind that specialty retailers like Abercrombie & Fitch and Zumiez trade at nearly 30 and 40 times forward earnings respectively. The only pertinent information is that these stocks have high short interest. The Russell 2000 has been outperforming since December and it has been rarely mentioned until recently. Once everybody starts noticing something it usually means it is late in the game. In the near term I expect that the period of outperformance is nearing its end. In December, the large cap space saw $50 billion worth of secondary offerings between Wells Fargo, Bank of America and Citigroup. I believe the digestion of that supply has been a major cause of the underperformance. Hedge funds, which traffic heavily in small caps, took down risk at the end of the year to lock in performance. I suspect that they have been re-risking recently. Retail sales were better than expected this morning. Last February was the heart of the economic crisis and comps are very easy. March was the bottom in the stock market and in the economy. Starting in April comps will get increasingly tougher and by the second half government stimulus will have a negative effect. I hate to sound like a broken record but I continue to believe that the direction of the market is a tough call at the current juncture. Its hard to see a sustained move higher or lower as so many readings are mixed. The market seems to be roaming around aimlessly. I have somewhat reduced my long exposure into strength this week and added a hedge but I don't want to go short until I see some exuberance. If there is one stock I had to hold for the next two years it would be Pfizer. I am currently short the March 18 Puts and the April 17's, so it is likely that I will soon be a shareholder. The company is supposed to earn $2.20 a share this year putting them at 8 times earnings. The $2.20 a share in estimated earnings for Pfizer actually understates their earnings power because their tax rate is unnaturally high. They are repatriating money from their overseas divisions in order to help pay for their Wyeth acquisition. Without repatriating that cash their earnings would be closer to $2.40 a share and Pfizer is closer to 7 times earnings. Most companies do not repatriate money because the US government taxes it. Instead they leave the money overseas and borrow domestically. Initially that makes EPS appear higher but then they are left paying interest on money they already have. Over time they end up paying a lot more money in interest than they would have paid to the US government. Analysts have frowned on Pfizer's decision to repatriate money and have had to lower their EPS estimates as a result. But there is a major conflict of interest. It is those same investment banks that the analysts work for that would have done the bond sales if Pfizer chose not to repatriate money. If more companies chose to do what Pfizer did investment banks would lose a lot of revenue. The market remains overbought but sentiment is still pretty neutral. In order to get more than a shallow pullback I believe sentiment will need to become more bullish. I was pretty sure that a breakout yesterday would get traders bullish. However, Rydex traders barely budged yesterday. We are up against resistance so a pullback would not be terribly surprising. I just would not expect it to go that far. 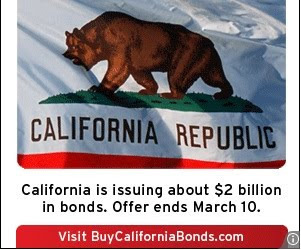 Greece sells bonds and fears subside, so I don't have to hear about all Greece all the time. The Employment report passes. I don't care if its good or bad. I just want it to be in the past. Everybody breathes a sigh of relief that Greece and the employment report are in the rearview mirror and buy stocks mindlessly. I go short. OL DAWG gives his stamp of approval and joins me by buying out the entire float of EDZ. Market participants find another part of the unbalanced global economy to worry about. While Vodafone is breaking out to a new 52 week high in London, I am not seeing any of the benefit as the British Pound has been getting beaten mercilessly. Vodafone's geographic revenue streams are not that different from a large US multinational's. They have the Verizon wireless stake, which is in US Dollars, and assets all over Europe and emerging markets. In the long run weakness in the pound should not matter all that much. However, in the short run it is clearly a headwind. I continue to believe that the economy is unbalanced and that the market is well above fair value. Readers know I am not one to shy away from the short side. However, if there is anything I have learned over the years is that it does not pay to be short when the consensus is negative. Looking at Rydex data, put/call ratios, sentiment surveys and anecdotal sentiment over the past few weeks has kept me away from the short side as the evidence has pointed to a bearish consensus. There are times when the consensus is negative and the market goes down more. But for the most part it is not a bet that pays. That is a lesson I learned the hard way and paid a lot of tuition for. We now find ourselves at the top of the range I envisioned and yet I am hesitant to put on many shorts. I am still not seeing the excessive optimism I look for before going short other than some silliness in small cap stocks. It is hard to believe that a 70 point rally in the S&P 500 has not made the crowd optimistic but the evidence of excess optimism is scarce. While I have added a hedge today I am not ready to go short.